There’s a lot of great local pork these days. 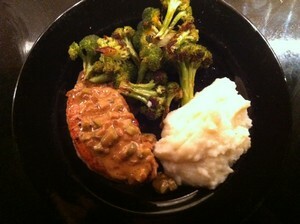 Here’s a delicious recipe for pork chops with Dijon mustard and French cornichons. Pair it with some mashed potatoes and a vegetable, and you’ve got an easy, impressive dinner. People who know the Accidental Locavore know, I’m a sucker for anything French and this comes from Burgundy, where the grape pickers would eat it after a long day picking all those grapes, so enjoy your favorite Burgundy or Pinot Noir with it. The link is to one of our favorites. Melt the butter and olive oil in a heavy large skillet over medium heat. Sprinkle chops with salt and pepper. Add to pan and saute until lightly browned. Turn chops, and cover pan. Cook until a thermometer reads 145 degrees, about 8 minutes (you can also poke the chops, if they seem hard, no bounce, they’re cooked). Transfer chops to a warm platter, tent with foil to keep warm while you make the sauce. Add water, shallot and garlic to pan. Cook until shallot is soft, scraping up any browned bits, about 2 minutes. You can also use a bit of wine, or chicken stock to deglaze the pan instead of the water. Add any juices from the chops. Whisk in cornichons and mustard-you need to whisk quickly so the sauce will emulsify. If you need to add more mustard to help it come together, do it. If you have cream stir it in at the last minute. Season with salt and pepper. Pour sauce over chops, sprinkle with parsley. Previous post: Fillet of Sole Meuniere With Fresh Picked Lemons…Local and Amazing!